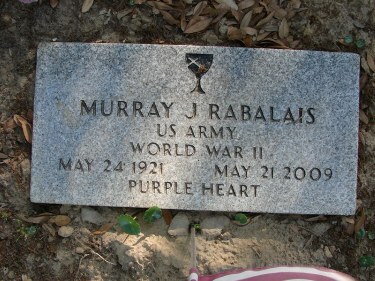 Murray Rabalais proudly served in the l0lst Airborne Division Parachute Regiment in World War ll. He grew up in New Orleans and volunteered in 1941, when war was declared. After receiving his silver wings, he spent a year in training before heading for England to train at night-jumping in preparation for D-Day. Having completed on his 21st birthday, his division made their jump on midnight of June 6, before the landing barges made the invasion of the Normandy beaches. They were scattered after the jump but regrouped to destroy the German big guns, disrupt communications, and prevent German troops from getting to the beach to repel the landing barges. After the beach was secured, Murray was sent back across the English Channel to a hospital due to a broken ankle, where he received his first Purple Heart. Following his recovery, his division flew into Holland for another jump, where he was wounded in the face — being then sent to Bristol, England for treatment and he received a second Purple Heart. He rejoined his outfit to head for the Battle of the Bulge, which he considers the fiercest battle of the war. This time, severely wounded in his knee, he was taken prisoner by the Germans. Due to the bitter cold, Murray credits the cold in preventing a wound infection, without medical care. After four months as a POW at Hammelsburg, Germany, when U.S. troops were within 100 miles the German guards retreated. Many of the prisoners walked to meet their rescuers, but Murray, being invalid, had to wait for his rescuers to arrive. He received his third Purple Heart for the Battle of the Bulge. Murray, co-founder of the 4-R’s Restaurant on Davis Avenue, Pass Christian, was 84 on May 24, 2005.